The electoral district of Preston may get smaller to improve African-Nova Scotian representation in Province House. Prominent figures in the African-Nova Scotian community are calling for a dedicated member of the legislature as part of electoral boundary reform. 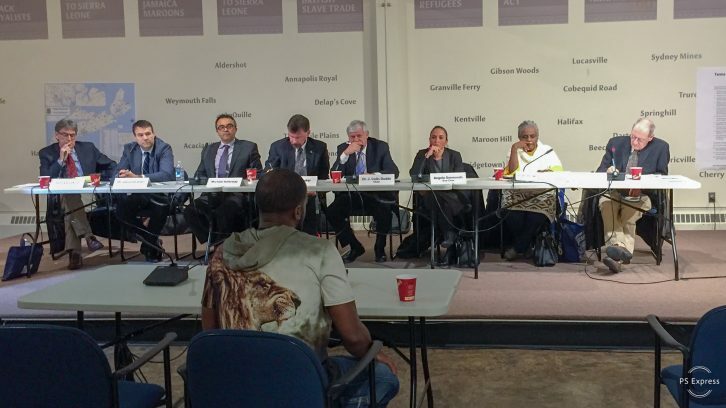 Irvine Carvery addressed a public hearing of the Electoral Boundaries Commission last week to argue for an MLA to represent African Nova Scotians throughout the province. Predominantly black communities such as Beechville, Preston and Birchtown share specific problems unique to the African-Nova Scotian community that require specific representation, said Irvine Carvery, the director of the community YMCA in greater Halifax. Carvery was one of an estimated 40 people who attended the commission meeting at the Black Cultural Centre on Jan. 15. The ceilings of the atrium were strewn with banners of famous Black Nova Scotians like Viola Desmond, whose image is on Canada’s $10 bill. Carvery was calling for an at-large member. Under that system, African-Nova Scotian voters would have the option to vote either for candidates running to represent their district, or candidates vying to represent African-Nova Scotians at large. Angela Simmonds, vice-chair of the Electoral Boundary Commission and a member of the African-Nova Scotian community, told The Signal previous consultations regarding members at-large received little support. “Part of the member-at-large (issue) for me, that I struggle with, is we yet again are asking our people to choose between one another,” Simmonds said. The commission is no longer exploring the idea of at-large representation, said Simmonds, but is focusing on boundary change options provided in its interim report. One option would maintain the same number of electoral districts in Nova Scotia: 51. The other three options recommend either 55 or 56 districts across Nova Scotia. The commission’s interim report suggests revising Preston’s boundaries to ensure the majority of voters are African-Nova Scotian, which would make sure there is African-Nova Scotian representation in the legislature. Because of changing demographics, this would mean a smaller district, with roughly half as many voters as the provincial average. The commission is dealing with similar issues in the Acadian districts of Clyde, Argyle and Richmond. The sentiment at the Black Community Centre was much different than the one expressed by Fédération Acadienne de la Nouvelle-Écosse on the subject of protected districts, which the Fédération believes is the best option for Acadian representation. Several people at the Jan. 15 commission meeting argued that making the district of Preston smaller doesn’t do enough to ensure black representation in the house of assembly. Dwayne Provo ran for the Progressive Conservatives in the 2006 provincial election in the Preston district and lost to the current representative, Liberal MLA Keith Colwell. “If we’re merely looking at trying to make the boundaries smaller to give a possibility of an African-Nova Scotian being elected, I think those attempts would be futile in trying to change the lot of African-Nova Scotians in Preston,” Provo said. Bobby Taylor, a local African-Nova Scotian resident, holds a similar view. Paul Gaudet, who sits on the Electoral Boundaries Commission, said they are trying to ensure the concentration of the population in Preston would be African-Nova Scotian so they can choose their own representative. “You’re talking about the land and we’re talking about the people,” he said in response to Taylor. The commission expects to present a final draft of its report to the provincial government on April 1. The final public meeting for the Electoral Boundaries Commission will be held on January 28, 2019, in Milford Nova Scotia. They will then submit their final report to the provincial government on April 1, 2019.